Although Marguerite and Eleanor grew up together at the court of their father, Raymond Berenger, Count of Provence, they turned out to be very different women. Why do siblings raised together turn out differently? Why do you think Marguerite and Eleanor might have been so different? As young women and new brides, what are the most significant differences between Marguerite and Eleanor? Which sister’s personality appeals to you more and why? In her own time, Eleanor was described as a “virago”—which meant overbearing or domineering. This term was not a compliment. Would she be viewed differently today? If so, why and how? How would Eleanor’s behavior have been judged had she been a thirteenth-century nobleman? It is said that “imitation is the sincerest form of flattery.” Several times during The Sister Queens, Marguerite consciously behaved as her sister Eleanor would instead of going with her own instinct. Did adopting an “Eleanor approach” help Marguerite or cause her to betray her own nature? Why do you feel as you do? What about Eleanor? Were her attempts to act “as Marguerite would” helpful or harmful to her? 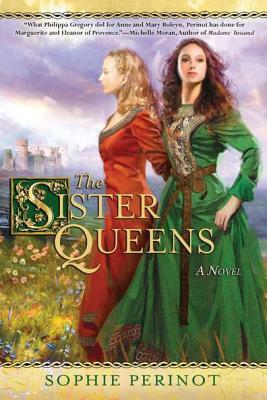 The Sister Queens is very much the story of the relationship between Marguerite and Eleanor of Provence, but it is also a tale of their individual relationships with their powerful husbands. Marguerite’s husband, Louis IX of France, was by all historical measures a great king. If you were transported by time machine back to the thirteenth century, would you want to be married to Louis? Why or why not? How important is professional competence/success in a spouse? Eleanor’s husband, Henry III of England, was not considered an able king during his lifetime and continues to rank as one of England’s least effectual rulers. If you woke up one morning married to Henry, would you be happy or unhappy? Why? Would you be embarrassed, as Eleanor sometimes was, by his political/professional shortcomings? How does Eleanor deal with that embarrassment? How would you? How were Marguerite’s and Eleanor’s relationships with their husbands a product of the period in which they lived? How were the sisters’ marital relationships affected by their being not only wives to their kingly husbands but also queens to their subjects? The marriages of Marguerite, Eleanor, and their two younger sisters were all arranged to bring their family political advantage and prestige. There is abundant historical evidence that such arranged marriages could turn out happily. How were historical couples able to find contentment with spouses not of their own choosing? Do you believe expectations for marriage were different in the High Middle Ages than they are today? How? Both Marguerite and Eleanor’s marriages evolve over the course of The Sister Queens. Marguerite began her marriage enthralled with Louis (who was, after all, pretty darn hot). Was she actually in love with him or merely infatuated? If Marguerite was just “crushing” at the beginning of her marriage, did she grow to love Louis? Do you think Louis was ever in love with Marguerite? Or was his attraction to her only lust? Feeling neglected by Louis, Marguerite entered into an extramarital affair with Jean de Joinville, Seneschal of Champagne. How did this decision affect your opinion of her? Why do you suppose Marguerite was willing to commit mortal sin (sin that, if not confessed and absolved, condemned the sinner to hell) in order to be with Jean? Would you have made the same decision in her circumstances? Eleanor did not expect to love her husband when she left Provence for England. How did Henry, more than fifteen years her senior and not particularly attractive, win her over? What factors in Eleanor and Henry’s marriage allowed them to live contentedly for so many years? Are those factors still important in modern marriages? More than a dozen years into her marriage to Henry, Eleanor found their relationship strained and stale without quite knowing why. Was Eleanor’s situation realistic and believable? Do you think midmarriage boredom is common? What methods did Eleanor use to try to rekindle her husband’s interest? Why do you approve or disapprove of these methods? In 1253, Henry chose to appoint Eleanor as regent in preparation for his travels to Gascony. He also made a will giving her custody of all their children, including Lord Edward, and control of all royal territories until Edward attained majority. The appointment of the queen as regent was not dictated by either law or custom (such an event had not occurred since the early years of Queen Eleanor of Aquitaine’s reign). Why do you suppose Henry granted Eleanor such massive powers? What does the appointment tell us about his opinion of Eleanor’s abilities? About his faith in her loyalty? Was Henry’s faith justified or misplaced? Blanche of Castile was a major obstacle to Marguerite’s influence over her husband and to her involvement in the governance of France. Why do you suppose Marguerite was so slow to recognize her mother-in-law as her enemy? Once she did, how did Marguerite work to defeat Blanche? Was she successful? At one point in the novel, Jean de Joinville told Marguerite, “Before coming to court, I heard that His Majesty cleaved too closely to his mother. These last days I have seen it to be true. The Dowager Queen treats the king as a boy, and thus unmans him.” Is de Joinville’s assessment fair? Why or why not? Another obstacle Marguerite faced as both wife and queen was Louis’s growing religiosity. Did Louis’s religious fervor cross from a positive to a negative characteristic? When and how? Where, in your opinion, is the line between piety and religious fanaticism? Was the line different in the thirteenth century? During the siege of Damietta, Marguerite was given her first real opportunity to shoulder the role of leader and decision maker. Did her handling of the crisis surrounding Louis’s military defeat and captivity change her? How? What, if anything, did it teach her about herself? When Louis first returned from captivity, Marguerite found herself experiencing feelings of tenderness for her newly vulnerable husband. Were you surprised by this development, and why or why not? Should Marguerite have cared for Louis? Why (e. g., out of duty; because he had earned her affection)? Eleanor was aware that the King of France had neglected and even mistreated Marguerite over the years. Eleanor clearly loved her sister; yet Eleanor was horrified when she uncovered Marguerite’s betrayal of Louis. Why did Eleanor find Marguerite’s adultery so shocking? Is it fundamentally more difficult for a happily married person to comprehend infidelity? When the sisters reconciled, did you have the feeling that Eleanor was able to forgive the sinner but not the sin? If so, how do you feel about that?